Bowlegs also known as tibia varum (singular) or tibia vara (plural) are common in toddlers and young children. The condition is called physiologic tibia varum when it's a normal variation and the child will grow out of it. Most toddlers have bowlegs from positioning in utero (in the uterus). This curvature remains until the muscles of the lower back and legs are strong enough to support them in the upright position. In some cases abnormal growth of the bone causes the bowing to get worse instead of better over time. This condition is called Blount's disease or pathologic tibia varum. Blount's disease becomes obvious between the ages of two and four as the bowing gets worse. Overweight adolescents or teenagers can also develop Blount's disease. The tibia (lower leg bone) or more commonly called the shin is affected by Blount's disease. 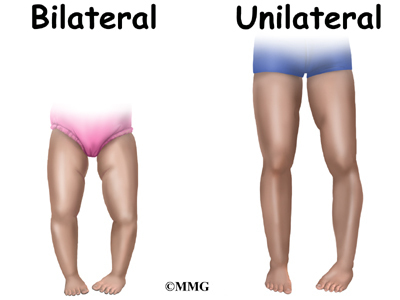 Infantile (less than three years old) Blount's is usually bilateral (both legs are affected at the same time). The bones start to form an angle and rotate inwardly. Adolescent (11 years of age and older) Blount's is more likely to be unilateral affecting just one leg. In Blount's disease the epiphysis and metaphysis both are involved. 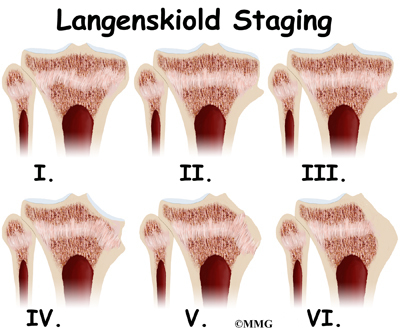 Only the medial or inside edge of the bone is affected. The metaphysis is the wider part of the tibial bone shaft. In the early stages of Blount's disease, the medial metaphysis breaks down and growth stops. 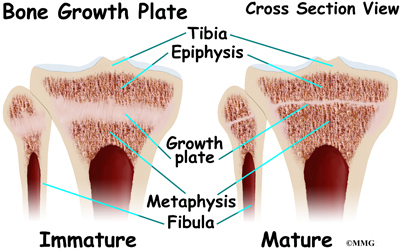 In the child who is still growing, the metaphysis containing the growth zone consists of spongy bone that has not yet hardened. Physiologic tibia varum occurs between the ages of 15 months to three years. There's no need for treatment for this normal stage of development. But it's not always clear at this age if the tibia varum is physiologic (normal variation) or pathologic (Blount's disease). 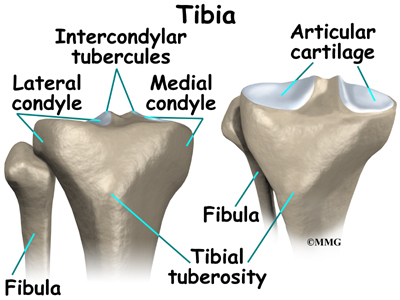 Blount's disease is caused by a growth disorder of the upper part of the tibial bone. Toddlers or children who are large or overweight for their age and who walk early are most often affected. As the child walks, the repeated stress and compression of extra weight suppresses (slows) or stops growth of the developing bone. When only one side of the tibia stops growing, there are abnormal changes in bone alignment resulting in this curvature or bowing of the bone. Juvenile or adolescent Blount's disease is usually caused by obesity (being overweight) but can be the result of infection or trauma that disrupted the medial growth plate. Treatment depends on the age of the child and the stage of the disease. Between ages birth and two, careful observation or a trial of bracing (also called orthotics may be done. 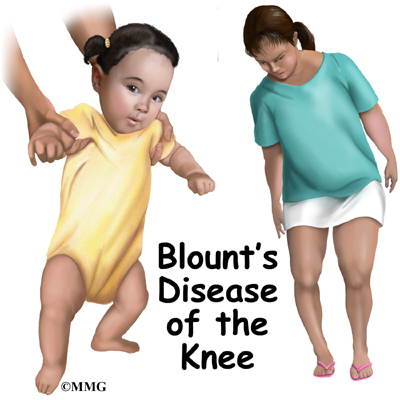 If the child doesn't receive treatment, Blount's disease will gradually get worse with more and more bowlegged deformity. Surgery may be needed to correct the problem. For the obese child, weight loss is helpful but often difficult. In the case of Blount's disease aggressive treatment is needed. Severe bowing before the age of three is braced with a hip-knee-ankle-foot orthosis (HKAFO) or knee-ankle-foot orthosis (KAFO). Bracing is used 23 hours a day. As the bone straightens out with bracing, the orthotic is changed every two months or so to correct the bowlegged position. Surgical correction may be needed especially for the younger child with advanced stages of tibia varum or the older child who has not improved with orthotics. Surgery isn't usually done on children under the age of two because at this young age, it's still difficult to tell if the child has Blount's or just excessive tibial bowing. 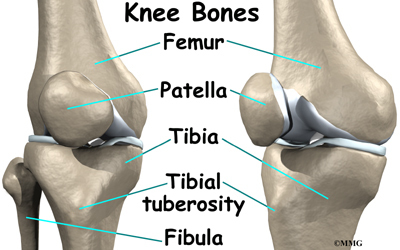 A tibial osteotomy is done before permanent damage occurs. Brace treatment for adolescent Blount's is not effective and requires surgery to correct the problem. 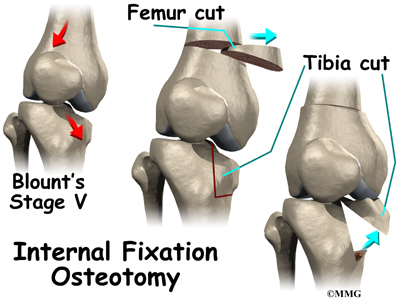 In an osteotomy, a wedge-shaped piece of bone is removed from the medial side of the femur (thigh bone). It's then inserted into the tibia to replace the broken down inner edge of the bone. Hardware such as pins and screws may be used to hold everything in place. 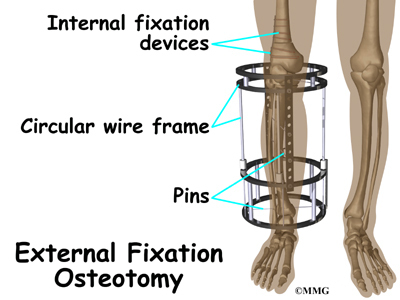 If the fixation is used inside the leg, it's called internal fixation osteotomy. 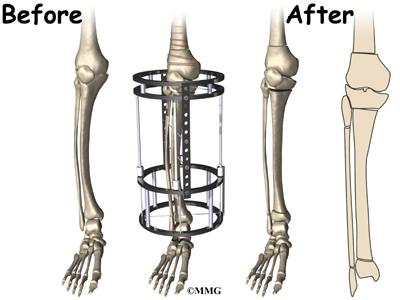 External fixation osteotomy describes a special circular wire frame on the outside of the leg with pins to hold the device in place. Unfortunately, in some patients with adolescent Blount's disease, the bowed leg is shorter than the normal or unaffected side. A simple surgery to correct the angle of the deformity isn't always possible. In such cases an external fixation device is used to provide traction to lengthen the leg while gradually correcting the deformity. This operation is called a distraction osteogenesis. The frame gives the patient stability and allows for weight bearing right away. Osteotomy with internal fixation usually heals in six to eight weeks. The cast is removed five to six weeks after the operation if there's enough bone build-up to prevent change or loss of position. A second cast is applied that keeps the knee straight but the foot and ankle free to put weight through the leg. Parents or guardians should be advised that Blount's disease might not be cured with surgery. Results are usually good with infantile tibia vara. When treated at a young age and at an early stage, the problem usually doesn't come back. Older patients with advanced deformity have a much higher risk of recurrence of the deformity. Patients must be followed carefully throughout their growth and development. Unilateral bowing can result in that leg being shorter than the other leg. This is called a leg length discrepancy and may need additional treatment.